Early Tudor (ca. 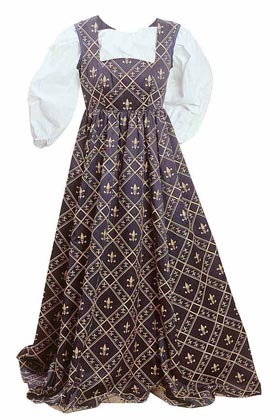 1500) styling with rich, fleur de lys patterned brocade. The dress is perfect for an evening or more formal occasion, but also perfect for visiting the faire. The back laces up and has an expansion panel to facilitate easy fit. Dry clean only. 60/40 cotton/poly blend brocade. Available in navy or in burgandy. Choose size small/medium or large/extra large. We've pictured the dress with the Long Sleeved Peasant Blouse (not included).